Watch five live John Cook-run practices! University of Nebraska Head Volleyball Coach; 2017 NCAA National Champions! Glean ideas for your program from one of the best programs in the country! 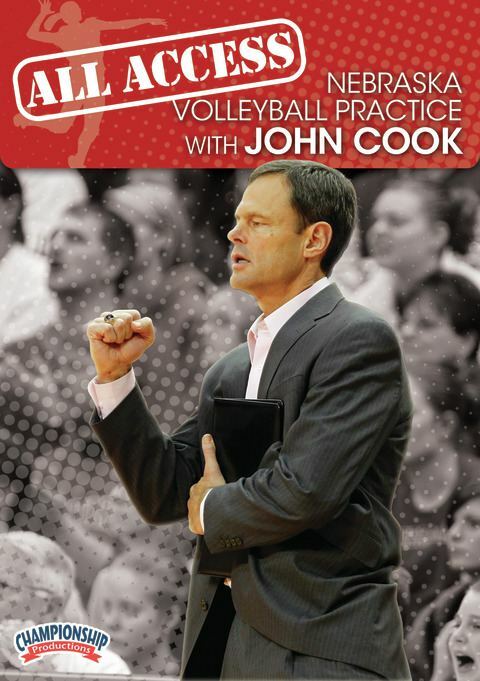 Get the best seat in the gym as John Cook gives you an “All Access” look at five of his early-season volleyball practice sessions, putting you directly in the heat of preparation for the fall campaign. You’ll see how Nebraska structures the flow and movement of a practice, which he demands execution at every phase, along with accountability even in the simplest drills. A lighter weight practice day where the coaching staff is getting in a maximum amount of repetitions for each player in a game-like situation. Coach Cook’s areas of focus are from the organized stretching at the beginning of practice, to a comprehensive training session, then shifting to a cool down process, then a post practice view of a team discussion on the values that are at the heart of the program. A “morning practice” format that features ‘no jump’ training to save the legs of the athletes. Coach Cook starts with a partner ball control series that focuses on shoulder rotation during the attack, platform angle management and complex series. The practice then progresses to a 2 v 2 series of competitive games, and ends with full court game-like drills. Over all the major emphasis is on the first contact: defense & serve receive. A “Recovery Day.” This single practice, after two-a-days the previous two days, shows the Nebraska squad working on Serving, Passing, Blocking and Digging with a focus on footwork. 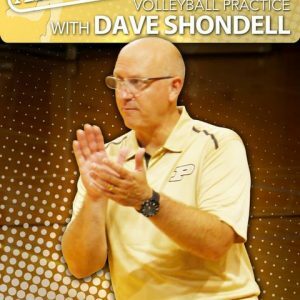 At the end of practice, Coach Cook breaks into individual drills, giving you an excellent look at the “Shadow Drill” as the Nebraska girls are taught proper footwork and transitioning, and their aggressive “Ball Group” drills that teaches the team defensive coverage and digging. Practice closes with a “behind closed doors” look at a team meeting. Get an inside look at full practices from one of the top programs and coaches in the country without leaving home. This video is the whole package and a great tool for coaches of all levels. 631 minutes (5 DVDs). 2012.